The last we saw of the survivors on The Walking Dead they had gone their separate ways after the battle at the prison. Now that the show has returned after its mid-winter break, we finally get to see what has become of those who escaped the massacre. Well actually, in the mid-season premiere “After,” we get to see what’s going on with a only few of them: Rick (Andrew Lincoln), Carl (Chandler Riggs), and Michonne (Danai Gurira). I had hoped this episode would at least provide some hint at what direction the show will be moving in for the rest of the season, but we didn’t get that. Really, we didn’t get a whole lot of anything except Carl, which I found disappointing. There comes a time in the life of every teenager when they must learn the lesson that they are not as grown up as they think they are. That time came for Carl in this episode. Intensely angry at losing everything, Carl takes out his frustration on his severely injured dad. Truthfully, Carl does as good of a job defending himself as anyone, but he makes stupid impulsive decisions – kind of like a typical teen. Most contemporary, real-world teens are not up against such dire circumstances. 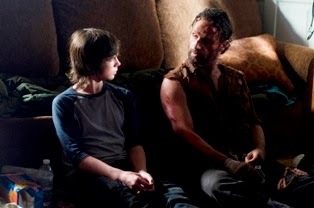 I liked that Carl had these conflicted feelings – though he lashed out at Rick, he was still wearing the police hat his dad had given him – but I felt like they didn’t need to spend nearly the entire episode focused on it. Meanwhile, Michonne was simply walking around overwhelmed by her feelings of loss. One of the best parts of the episode dealt with her previously only hinted-at back story. In a nightmarish dream sequence, we learn Michonne once had a husband and a son. The dream sequence was well done, seeming like a real dream – it was weird and scary without being over the top. It seemed like something anyone might really dream about. I would’ve liked a little more of her story, but they seem to only want to reveal little bits at a time. Other than an extended sequence where she mows down a herd of walkers, she isn’t given all that much to do. Still it was good to see her character expanded. This episode was an okay watch, but not a lot really happened to advance the story. Rick spent most of it unconscious while Carl wandered through a neighborhood, determined to prove he doesn’t need his father anymore. I think the lesson might be that it’s hard to get by in this post-apocalyptic world on your own. Kind of like this show’s version of an After School Special. Michonne clearly didn’t want to spend her time only in the company of walkers and Carl soon found that taking care of yourself isn’t all it’s cracked up to be. 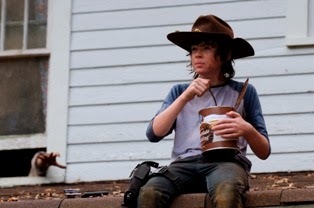 And he clearly needs someone to tell him eating a 112 ounce can of pudding all at once might not be the best idea. So we know those three are safe for the moment, even if they have no plan whatsoever. We will have to wait until next week to see what has become of Daryl (Norman Reedus), Beth (Emily Kinney), Maggie (Lauren Cohan), Glenn (Steven Yeun), Tyreese (Chad Coleman) and the rest of the prison survivors. I’m also curious to see when/how they bring Carol (Melissa McBride) back into the fold – if they do, that is. Of course one of the biggest mysteries is the fate of baby Judith. Rick and Carl assume she died in the prison massacre, but I’m not so sure about that. Mostly I’m curious to see what kind of storyline they develop for the rest of the season. Unfortunately, “After” brought the show back from hiatus with what is essentially another time-marker episode (the worst crutch The Walking Dead relies on).